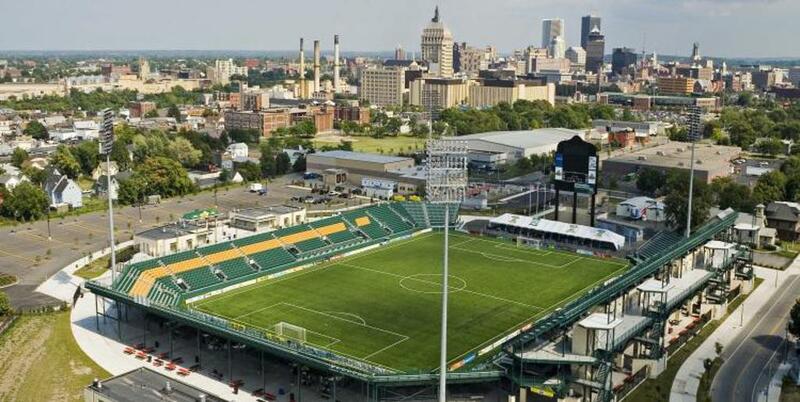 Marina Auto Stadium, formerly PAETEC Park, Rochester Rhinos Stadium, Sahlen's Stadium and Capelli Sport Stadium, is a soccer-specific stadium in Rochester, New York, US. The stadium is home to the Rochester Rhinos of the United Soccer League. For this season, the stadium will host four matches for fellow USL team Toronto FC II while the Rhinos are on hiatus. In addition to this the Rochester Lancers and Lady Lancers, of NPSL and UWS respectively, will play their home games at Marina Auto Stadium for the 2018 season. The stadium also hosts other sporting events such as high school soccer, Rochester Junior Rhinos soccer games and practices, American football, field hockey, boxing matches, and concerts. Rochester Flag Football Tourney to be held at Marina Auto Stadium! Join us for a free soccer clinic this Sunday! Thank you for your support of this great and worthy charity! ©2019 Rochester Rhinos / SportsEngine. All Rights Reserved.